The thrilling history of the Targaryens comes to life in this masterly work by the author of A Song of Ice and Fire, the inspiration for HBO s Game of Thrones. What really happened during the Dance of the Dragons? Why did it become so deadly to visit Valyria after the Doom? What is the origin of Daenerys s three dragon eggs? These are but a few of the questions answered in this essential chronicle, as related by a learned maester of the Citadel and featuring more than eighty all-new black-and-white illustrations by artist Doug Wheatley. Readers have glimpsed small parts of this narrative in such volumes as The World of Ice & Fire but now, for the first time, the full tapestry of Targaryen history is revealed. 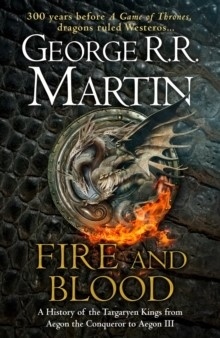 With all the scope and grandeur of Gibbon s The History of the Decline and Fall of the Roman Empire, Fire and Blood is the ultimate game of thrones, giving readers a whole new appreciation for the dynamic, often bloody, and always fascinating history of Westeros.